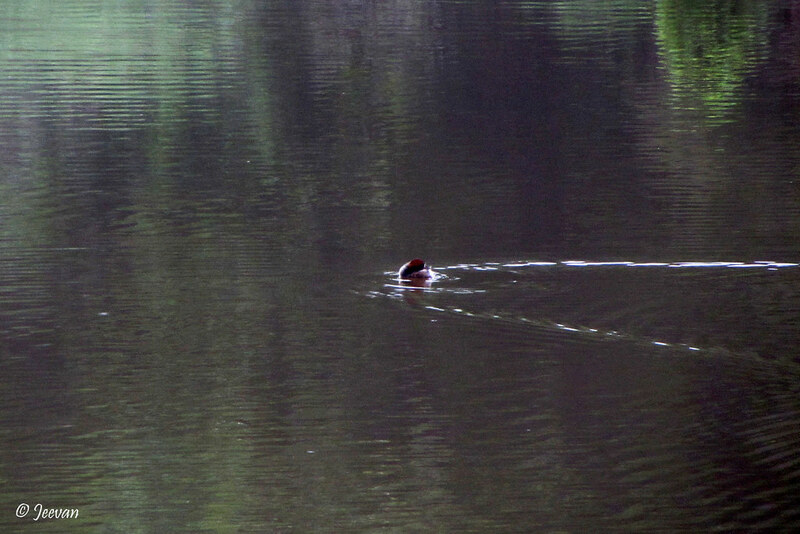 The Little grebe, also known as Dabchick, is a member of the grebe family of water birds that I found in the Kukkal Lake, a pristine water body near Kodaikanal. About 30km from Kodaikanal, the Kukkal Lake sits amid a great ecosystem which includes swamp, grassland and sholas and during my visit to the lake first time in 2012, I was amused to check this little bird species creating lovely ripples across the lake. I initially thought it to be an insect due to it’s smaller in size but only at the maximum zoom length on my point and shoot cam I come to reveal the bird and at that moment also I considered it as a little duck. At 23 to 29 cm (9.1 to 11.4 in) in length, Dabchick is the smallest European member of its family and commonly found in open bodies of water across most of its range. The little grebe is a small water bird with a pointed bill and the adult is unmistakable in summers, predominantly dark above with its rich, rufous colour neck, cheeks and flanks, and bright yellow gape. The rufous is replaced by a dirty brownish grey in non-breeding and juvenile birds. 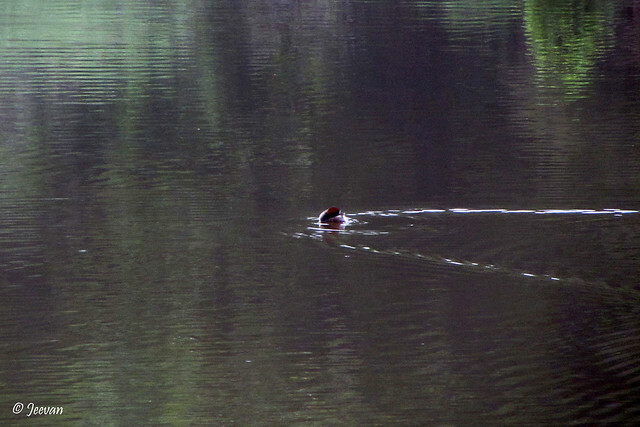 The little grebe is an excellent swimmer and diver and pursues its fish and aquatic invertebrate prey underwater. It uses the vegetation skilfully as a hiding place, and during my visit too, I checked the bird taking numerous dips on the tranquil lake. Hello, great info and post on your cute Dabchick! Thank you so much for linking up and sharing your post. Have a happy weekend! Excellent description of this small skillful bird. 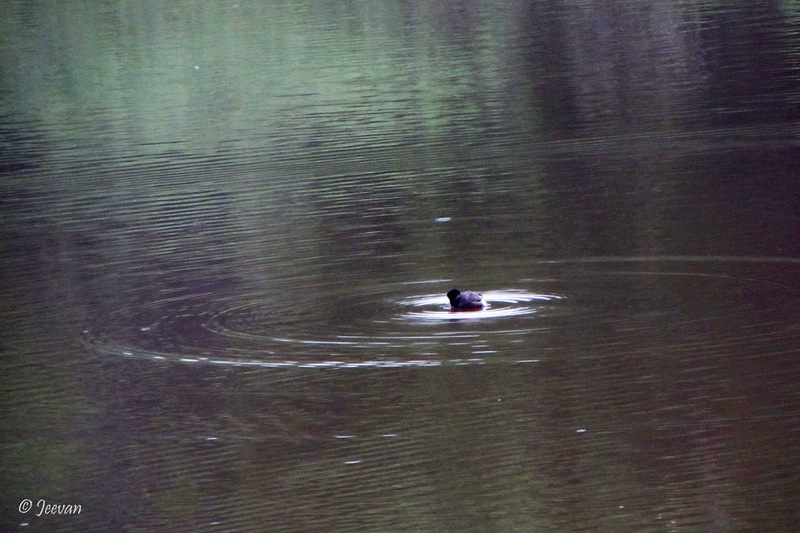 It does create the magical ripples around the point where it skims the water for its prey. Lovely clear shots! Grebes are among my favourite water birds, Jeevan! I have heard of grebes but never have seen one in real life. I liked the photos. i like the grebe family, too! You were fortunate to capture the birds at the right moment. I seldom see water birds here. It really does remind me of a duck. Good thing you have such a great camera, Jeevan. Thank you for sharing the picture with us.